Arghh!! I don’t have time to play with dolls today! I have a to-do list as long as my arm, but I had to show you version two of the backpack! I went on a slider search and, while I didn’t find any of the sliders I used for the first version, I found the perfect buckles for this project! These buckles are made by Tim Holtz idea-ology. I think these should be fairly easy to find, at least for now. I picked them up at Joann for $5.99 (minus 40% off coupon). I believe Hobby Lobby also carries this brand. If you must have them and prefer to have them sent right to your door, they are also available on Amazon. Caroline immediately claimed this bag as her own. Can’t say as I blame her! I made this one with flannel and trimmed it with faux suede. I used real leather for some of the straps. I purchased the leather in a scrap bag at Hobby Lobby. I punched some holes and set eyelets to finish off the look. I love how it came out! Okay, I really, really must go now. I am hoping to digitize the pattern on Monday for you and perhaps do a step by step sew-along. Does that sound fun? 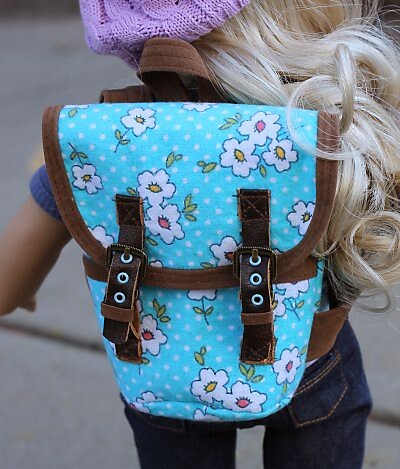 ← Avery’s New Backpack and Free Pattern Sneak Peek! Yes! Thank you so much for giving us the pattern as well as where to get buckles.